PHILIPSBURG – Minister Jacobs along with the St. Maarten delegation finalized four days of marathon meetings with Ministries of Higher Education, Culture and Tourism as well as Universities of Arts, Medicine, Hospitality &Tourism, Pedagogy & Sports with firm commitments to collaborate to share expertise, promote student and professor exchange, technical assistance, research collaboration as a Kingdom partner and more importantly as a fellow Caribbean country. The welcome by the Government and professional community of Cuba was indeed heartwarming and encouraged future cooperation. 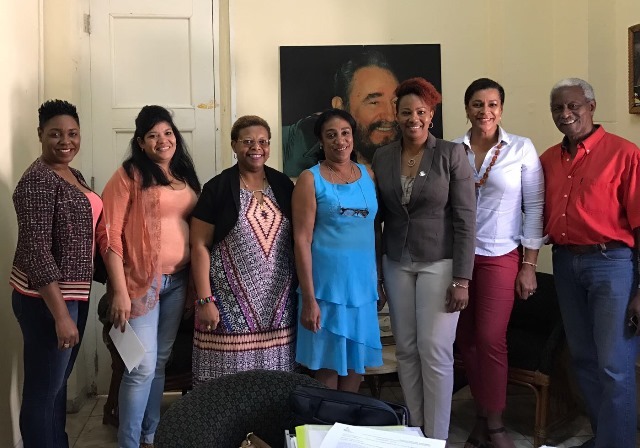 Ministry of Education, Culture, Youth and Sport, can expect to come to some firm agreements within the coming months as to the scope of a multiyear plan of cooperation between Cuba and St. Maarten which marks a historical first at this level. The opportunity for a delegation to travel to Cuba to secure a part of our cultural heritage through the film industry and gain exposure through exchange in the Caribbean market is expected as soon as the end of June. Contacts were made with University of Havana Hospitality and Tourism, Vocational School of Arts, the Latin American School of Medicine, the Pedagogic University, the University of Physical Culture and Sports and the Technical Chemical School, which will be shared with vocational and higher education institutes on St. Maarten to further enhance their program development as well possibility to St. Maarten students including artists and athletes to matriculate at Universities in Cuba. A comprehensive report will be shared with the Council of Ministers and stakeholders in an effort to make the most of this Kingdom mission to Cuba which will result in many positive actions which fit perfectly within our 4 year governing program recently made public. While Cuba is seen as a poor country, the country and the people are very rich in their cultural developments and educational systems where everyone has equal opportunity for education and development of their potential in sport and arts as well as those with special needs. Minister Jacobs extended warm, heartfelt appreciation and thanks to the Cuban government for their hospitality as well as the willingness to work with the Dutch kingdom and specifically the Dutch Caribbean islands to further enhance our country. She also thanked the Dutch kingdom for affording the St. Maarten the opportunity to broaden its horizons.